Kuala Lumpur here we are ! Kuala Lumpur here we come! The Indian Ocean is an ocean of emptiness. Four days we did not see any land, no other ships, no birds, no airplanes in the skies, no dolphins, not even flies (waiting for us in the next port), only occasionally some flying fish speeding away from our hull. 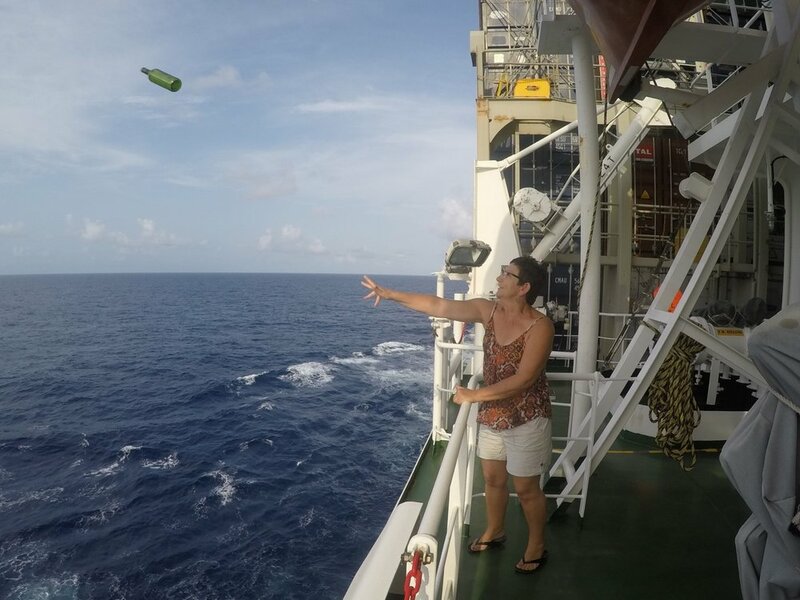 Approximately 1200 km from the nearest land we threw a bottle with a message in the deep blue water: will anyone ever find that? One day the first officer showed me the very bottom of the ship, inside the cargo hold. We climbed cat ladders down 18 meters. With only the double bottom of the hull between me and the ocean floor 2600 meters below, I felt tiny standing in this huge hull. It was hot and humid, sweat was running down my back. Looking up while the hatch covers screeched due to the keel constantly bending, there were 16 containers stacked high: a truly impressive sight. There was another BBQ on the aft D-deck, this time the Philippino’s set up a few boom-boxes providing loud music. The tropical air was humid and the evening temperature didn’t drop below 28 C. An 11 kg suckling pig cooked above the coal fire for four hours. After our cook cut it up, the remaining pig’s head kept staring at us, so Francien and I decided to put some steaks on the fire instead! Yesterday morning crossing the Strait of Malacca, we straddled the mountainous coast line of Sumatra, shrouded in thick and threatening clouds. Being one of the busiest shipping channels in the world, we indeed saw ships all around us: containerships like ourselves, bulk carriers, oil tankers, car ferries, RORO vessels and small wooden fishing boats adding to the traffic. Unfortunately before we could enter the port of Klang, we had to drop anchor for 36 hours as our berth was still occupied: those were the longest hours of the entire journey! With one day delay we have arrived! The deck crew hoists our luggage from the B-deck onto the seawall 20 meters below. We say good-bye to the CMA Titan which had become our home for the last four weeks and a port shuttle bus drives us to the immigration offices where our daughter Marcella is waiting for us. ‘Why do you go on such a boat trip? How did you get this idea of doing this?’ family and friends had asked before we set off on this journey. Well, since many years we wanted to experience travel to a distant place. We hoped that traveling by boat you get a real sense of what it means to journey to the other side of the world, rather than by airplane, which jets you within hours comfortably across the globe. In the 34 of our expatriate years, we ourselves have shipped household goods around the world in these 40 feet containers (between Europe, USA and South Africa) and somehow we always sought to experience this ourselves. 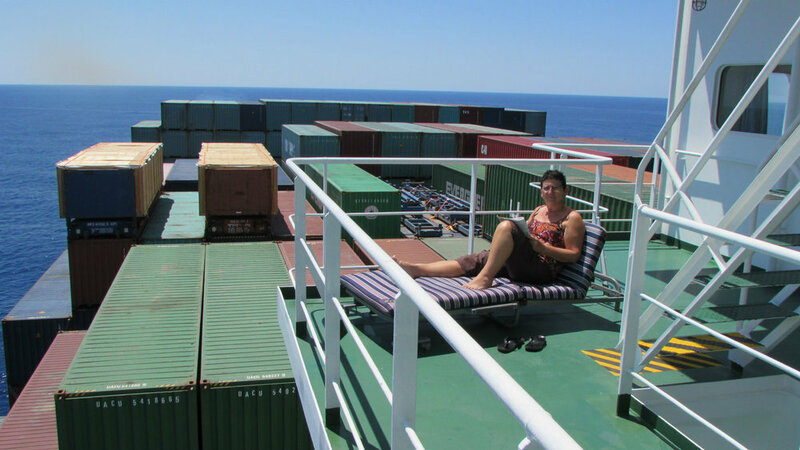 Francien and I also wanted to bring back a good story to be shared with others, for traveling on a freighter is something not very often undertaken by people. Besides the adventure of the unknown given this unique way of traveling, indeed we now do appreciate what a distance of 15900 kilometres means: we crossed seven time zones without noticing, temperatures gradually increased approaching the Middle East, dropping slightly sailing into the tropics. Going East on the Indian Ocean dark monsoon clouds built up and humidity surged. We saw the rock of Gibraltar, the rugged Algerian coast line, the Island of Crete on the horizon, the Sinai desert, the barren coast lines of Yemen and Djibouti and the green volcanic mountains of Sumatra. At sea, only the gradually changing GPS coordinates on the bridge showed that we were actually traveling. However, we both felt that time on board passed faster as expected. Internet was provided, albeit extremely slow (I had to get up mid-night to check e-mails and send blog posts, was not able to check the news). We were free to go any place on the ship as long as we kept the crew informed, learning how this vessel works and is being managed, about navigation, cargo handling and the solitary lives of these sailor men. 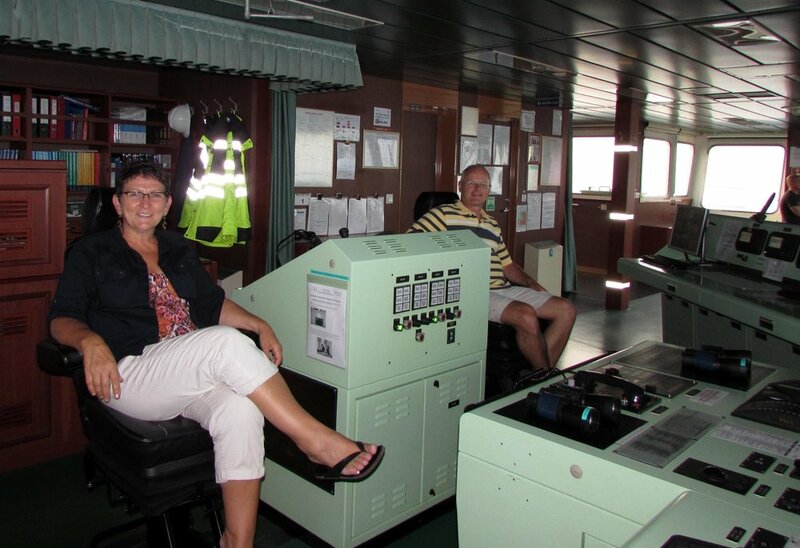 The exciting feeling going through pirate waters, the impressive views when crossing the Suez Canal, walking 15 meters below sea-level in the gigantic cargo holds of the ship and seeing the endless vastness of the Indian Ocean will stick to our memories. The language barrier, with no other passengers on board, was indeed challenging. The first two weeks we had to constantly be inquisitive to get information’s as the crew was friendly, but rather indifferent. Later on they opened up a bit more, but still were not the greatest of communicators! Going on shore in Zeebrugge, Southampton, Le Havre and Beirut were welcome breaks in an otherwise monotonous daily routine, but rather arduous. Nobody gave us accurate information about the procedures to follow. Once berthed, we had to be patient until the officers figured out where to get transportation and shore passes. The vessel stays no more than 24 hours in each port, but the exact departure time depends on the progress of the loading, forcing us to be back with plenty of time to spare: The ship would definitely not wait for us in case we were late! Preferring predictable order, going on shore was a rather chaotic process, losing a lot of precious time. Unfortunately we did leave our own footprint throughout this exciting journey; a crimson plume trailing our ship as we burned 110.000 litres of heavy fuel oil per hour! Despite the non-alcohol policy on board, captain drinks and BBQ’s turned out to be rather animated and jolly events! Guess why? And what about allowing hawkers on the upper-deck selling trinkets while in port? What was the message in bottle? Would Francien and I continue sailing on this ship going to China and Korea if we had a choice? Where is ‘The Citadel’ in which we would be hiding in case of a pirate attack? But what happened on the Titan, stays on the Titan! Reflecting back on this trip, it was neither romantic nor were the sailor men roughnecks as so often stereotyped. For them it is a long, hard and lonesome job, earning a living by delivering thousands of containers effectively each day around the world. Yes, it has been relaxing, but not to the extend we thought it would be (we did not start sleeping-marathons, meditating or yoga!!). The mornings were spent in the gym, we watched every other evening a movie, had enough interesting reading and writing to do and until the last day enjoyed the constantly changing and mesmerizing views of the ocean. Our pace slowed down considerably after the first days on board, but each day there was some other interesting activity happening on the ship to keep us busy. When we embarked on this trip, Francien and I took ourselves out of our normal life. We received little to no news from the outside world, something we did not miss at all. However we missed hearing the voices of family and friends. It has been a great adventure and both of us really enjoyed it. Now it is time to (maybe temporary) settle down in our newly adopted home country Malaysia, the next exciting challenge waiting. Kuala Lumpur, here we are!